This brilliant debut novel is a western fantasy that turns on steampunk cogs greased with lots of grue. We ride into the story with fifteen-year-old Jim, who carries the eye of his dead father in his pocket –a jade prosthetic crafted by Chinese sorcery. Jim and his horse nearly die as they ride across the desert, but are rescued by Mutt, a Native American shape-shifter. Mutt leads them to the mining town of Golgotha, where a Lovecraftian god is rising to undo creation (with a little help from a certain fallen angel). Joining the battle to save the world are an undying sheriff who was hanged three times and has the scars to prove it, a woman with the blood of Lilith in a vial around her neck, a Mormon minister with an “unnatural” secret, and a taxidermist who knows death far too intimately. Every chapter is named after a Tarot card which, when interpreted, informs the narrative. 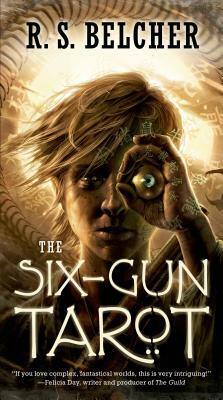 I’m putting all my chips on The Six-Gun Tarot making the short list for the World Fantasy Award.